Bristol Rovers and Bristol Rugby will play all their home games at the Memorial Stadium next season because of a delay in developing the ground. Rovers had planned to play at Cheltenham Town's Whaddon Road ground from the middle of the season. 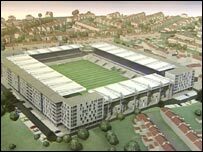 Work on developing "The Mem" into an 18,500-seater stadium will now begin in May 2008, with a scheduled completion date of December 2009. Some residents around the stadium oppose the development. Rovers' chairman Ron Craig said: "We are disappointed with the delay to the start of building our new stadium, but it is a bonus that we can complete our first season back in League One without having the disruption of moving half way through our fixtures. David White, chief executive of Bristol Rugby Club, added: "The announcement allows us to stay at home for the duration of this vital season and allows us to confirm to our fans and partners the final details for the season." Bristol Rugby will play two home games at Ashton Gate: against Gloucester on 17 February and Bath on 2 March.